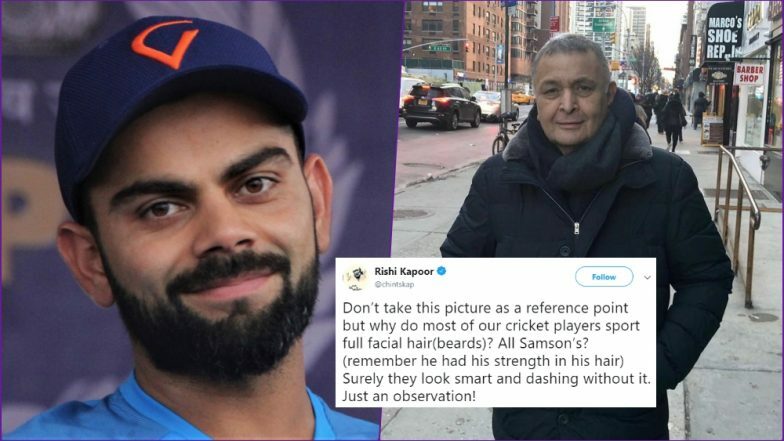 Indian Cricket Team for ICC Cricket World Cup 2019: Rishi Kapoor Compares 'Men in Beard' With Samson, Know Who is This Mythological Character? Bollywood actor Rishi Kapoor is known for his amusing tweets. The actor in his latest tweet made an important observation about the Indian cricket team for ICC Cricket World Cup 2019 which was announced yesterday. While the cricket lovers are busy analysing the strengths and weaknesses of the players in the team, Rishi Kapoor made an observation about the beard of these cricketers. The actor called all the bearded player as Samson, last of the judges of the ancient Israelites. And if you are curious about who is Samson, then let us tell you more about this mythological character. ICC World Cup 2019 Squad: BCCI Names Khaleel Ahmed, Navdeep Saini, Deepak Chahar and Avesh Khan as India's Net Bowlers for The Tournament. Rishi Kapoor put up a picture of the 15-player squad of the Indian World Cup team and wrote, "Don't take this picture as a reference point but why do most of our cricket players sport full facial hair(beards)? All Samson's? (remember he had his strength in his hair) Surely they look smart and dashing without it. Just an observation!" Well, Samson was a character who was known for the strength in his hair. His strength would allow him to perform superhuman feats. However, his girlfriend Delilah betrayed him and got his hair cut by a servant while he was sleeping. Thus, Samson lost all his strength. Rishi Kapoor Wants Female Cricketers in the IPL Auctions and Here's How Twitter Reacted. Well, so the actor seems to be assured that all our bearded these players are the strong ones in the game. Social media was quick to appreciate his observation. One of the Twitter users wrote, "I know! What is this recent trend of beards and all the young men in the real world also following it! Weird not bring able to see real FACES behind the hair!" Meanwhile, other user related to the actual reference and said, "Hahaha Gm Chintuji nice to see you here in light mood. True may be as Samson Deleila had Premnath ji your uncle who had all his strength in his hair right ?" Well, Rishi Kapoor made a clever observation indeed.